This week's letter of the alphabet is K.
My word is kenning, or ken. Kenning is a verb, albeit an old one, that means to recognize or identify. Ken is a noun, it means your range of knowledge or understanding, or the reach of your sight. 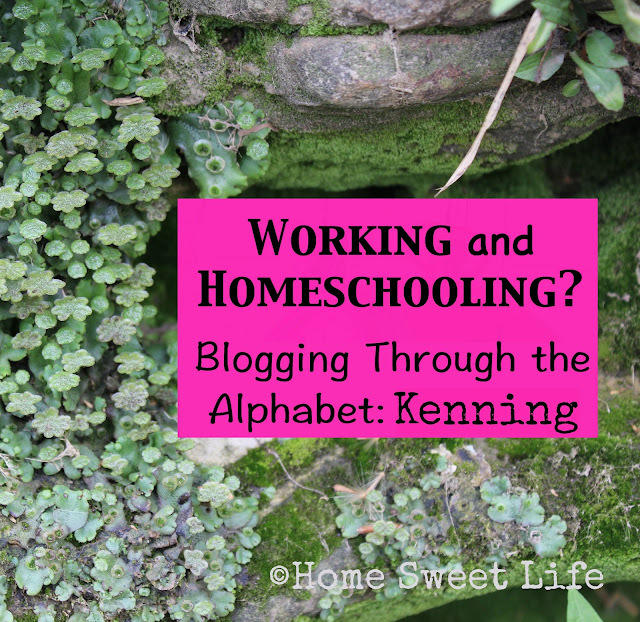 How is kenning a blessing along a home education journey? Because it both opens and limits what we do and learn. Kenning can be learning to recognize or identify more or new things - like letters, plants, or birds. It can also be kenning to understand your limitations, and allow that your home and life do not need to look like everyone else's! Kenning your strengths and weaknesses, kenning your children's learning styles, and the ken of your math program. The ken of my daughters' learning, their range or understanding or the reach of what they have studied can be freeing, by reminding them that they can learn about anything, but they do not need to know everything. 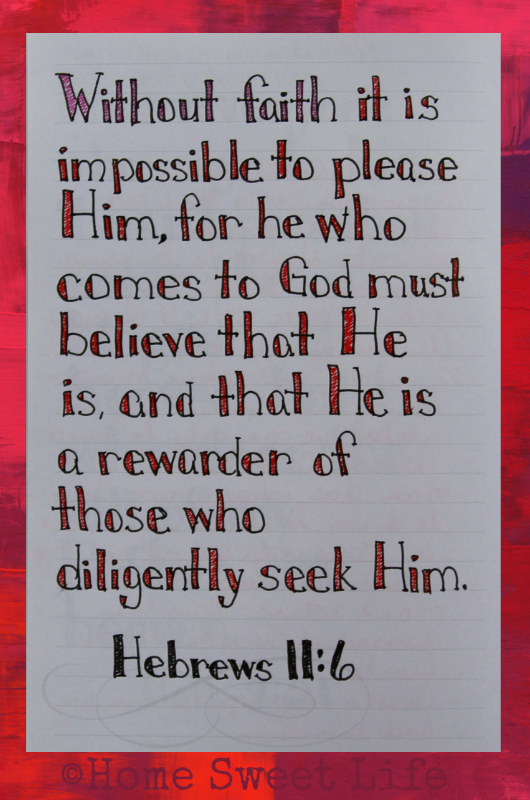 Only God is Omniscient. Only God knows everything. If you read older English or Scottish books you will probably run across the words ken and kenning. In the meantime, remember that this homeschool journey is just that - a journey. Ask God to help you set the ken for this year - the range of your sight for what you hope to cover, and then be comfortable if He changes your plans. Oftentimes the interruptions in our homeschool days are where the most learning takes place! If you would like to expand your ken of homeschooling High School, just click on the orange tagged words below and read other posts about our High School homeschool journey. Thanks for stopping by, be sure to check out the other K posts by clicking the link below! What states my meaning, what describes my nature? What is the scope of my life? I would hope that my life would be defined by the fruits of the Spirit: love, joy, peace, patience, kindness, goodness, faithfulness, gentleness, and self control. Sometimes I get off the mark though, and my life is defined by crankiness, a bad attitude, and too much to do. How do I hit the rest button and get back where I belong? Prayer and time spent in God's Word. 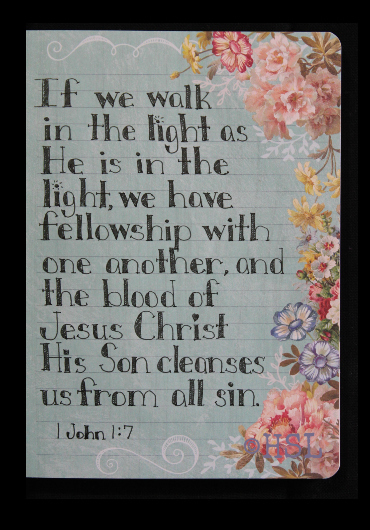 Reading God's Word defines who I should be, by helping me learn to be more like Christ. Prayer gives me an opportunity to commune with God, to ask Him to show me where I need to be transformed, and where I can petition Him on behalf of others. The very best way I know to stop being cranky with someone is to start praying for them. You cannot love a person through prayer and remain mad at them. If you are truly surrendering to God's will in your prayers, He will remind you again and again how much He loves them, and how much He loves you. Do any of these phrases form your idea of Embrace? Often one of our girls will come up and say "Morning hugs" or "Bedtime hugs!" A time to embrace. 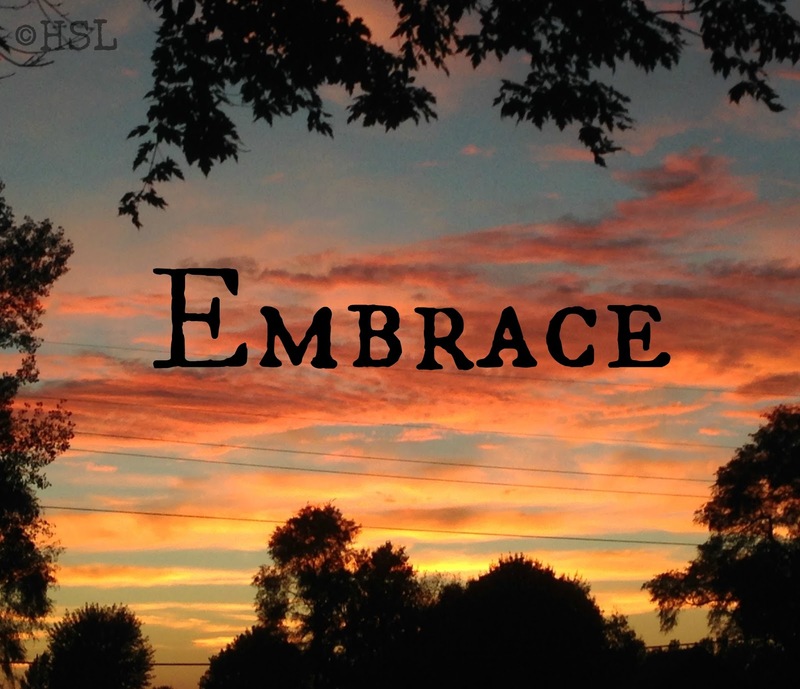 Do you embrace your spouse? 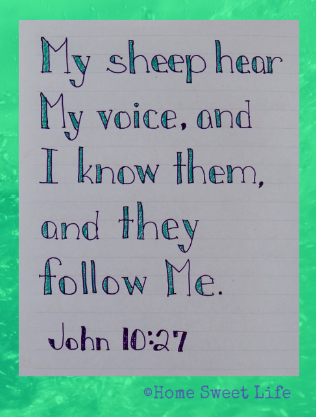 Do you gather them to your heart and hold them safely there with prayer? Do they matter more to you than any other person in this world? Have you acknowledged an idea or a plan? I want to embrace the plan God has for my life. I want to reach out and embrace this life I'm living. I want to move towards the future with determination and joy, I want to reach for the good things, and not be afraid of the painful times. An embrace requires us to open our hearts, our arms, and often our minds. It opens us up to the possibility of rejection, but we should not fear embracing. 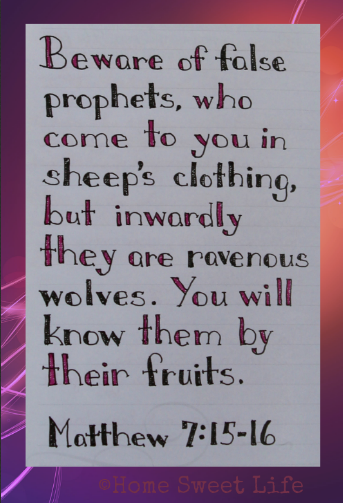 God's Word tells us that His perfect love casts out all fear, because fear has to do with punishment. (1 John 4:18) An embrace can be exactly what you need - like when your child says "I need a hug Mommy." Embrace your spouse - remember they are your lover, not just another adult living in the same house! Embrace God's plans for you. Embrace your life. Each day is a gift, start viewing it as such! May you feel God's warm embrace, and may His peace bring you comfort! Back when Annette and Amanda first mentioned blogging through the alphabet this year, I went ahead and wrote down a lot of idea prompts for letters. One of the first letters to get filled in was J. This home education path is a journey. It is not something to decide all at once, it is not something to try to master all at once. It takes time, lots of effort, and a willingness to adapt. What is that old saying? The journey of 1,000 miles begins with a single step. 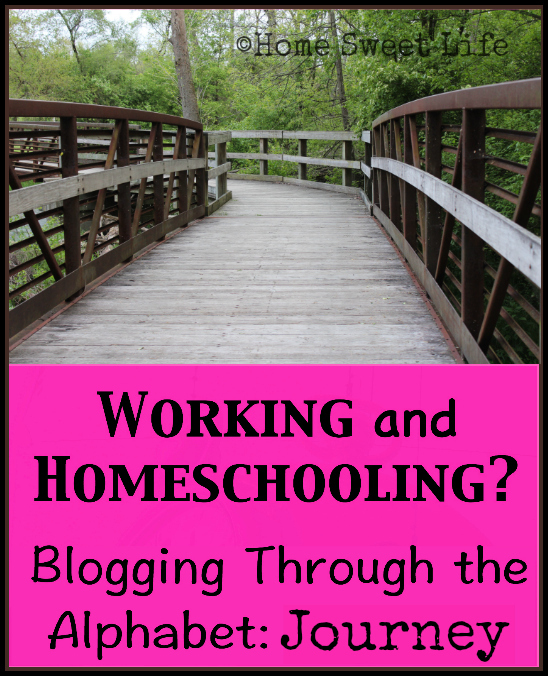 Homeschooling is a choice, followed by a journey filled with other choices. Similar to the bridge in the picture above, we had a general idea where we thought we wanted to go. We could see the beginning of the path, but not around the corner. Life is like that whether or not you homeschool. Only God knows what lies around each bend or hill of our lives. 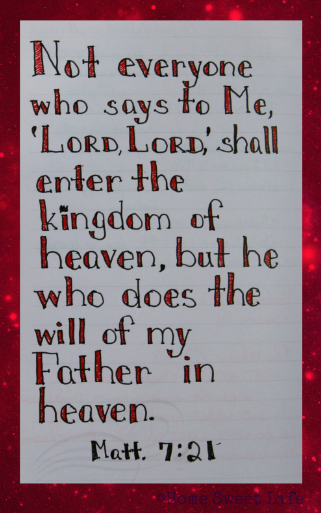 It is important to remember that He promises never to leave or forsake His children. If you are His child, He is right there with you. You don't have to understand it, you just need to believe it! Just as we have to learn to trust God as new Christians, we need to learn to trust His guidance when it is time for our children's education. 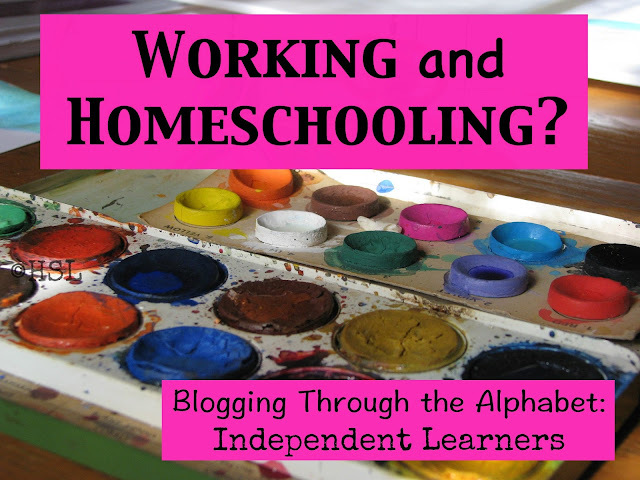 If He is calling you to homeschool, and He has made it obvious to you that you are going to need to work as well ~ guess what? 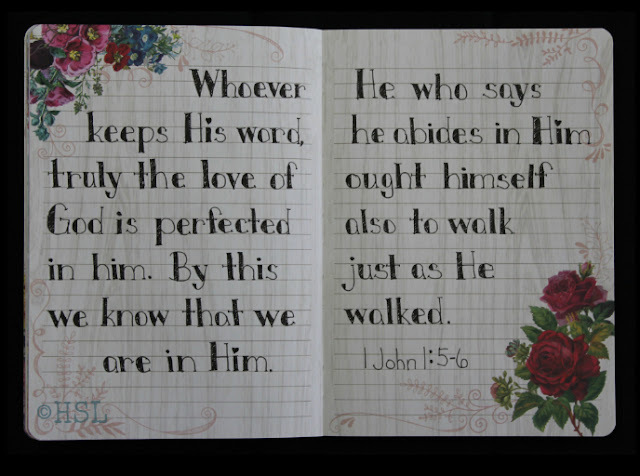 He will be there every step of the way. It will not be easy, but it will be worth it! If He is calling you to homeschool, and you can manage to make it as a family on just one income, I think that is better. 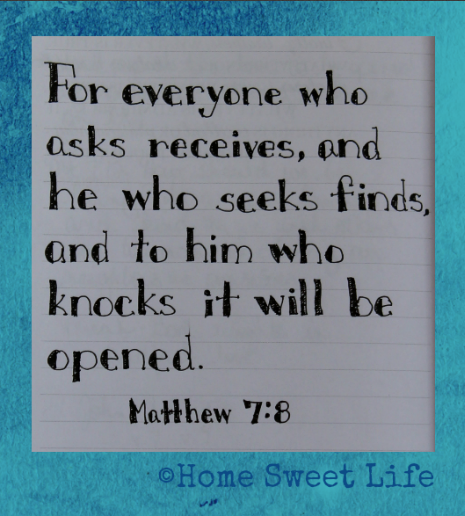 Try to make it happen, but also realize that might not be God's answer for your family. There have been several times (hundreds?) over the past 13 years when I have wished and prayed to be able to stay at home with our daughters. God's answer has always been "My Grace is sufficient." Sometimes I have not really liked that answer. Sometimes it has been so heart-wrenching to get up out of bed and go to work when I just wanted to stay home and cuddle and read books on the couch. Yet, His grace has always been sufficient. On the days when I wonder if I'll have the strength to walk upstairs to go to bed because the day has been so physically taxing ~ His grace is sufficient. 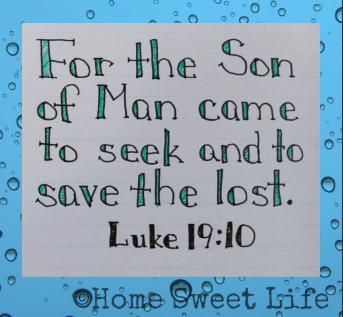 On the days when I cried my eyes out because I just wanted one day that looked 'easy' like other Moms seem to have that get to stay home ~ His grace was sufficient. Today? 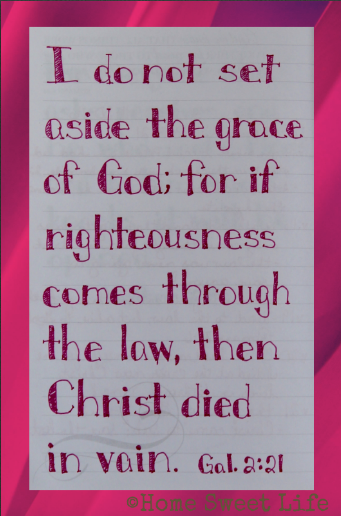 Even today His grace is sufficient! 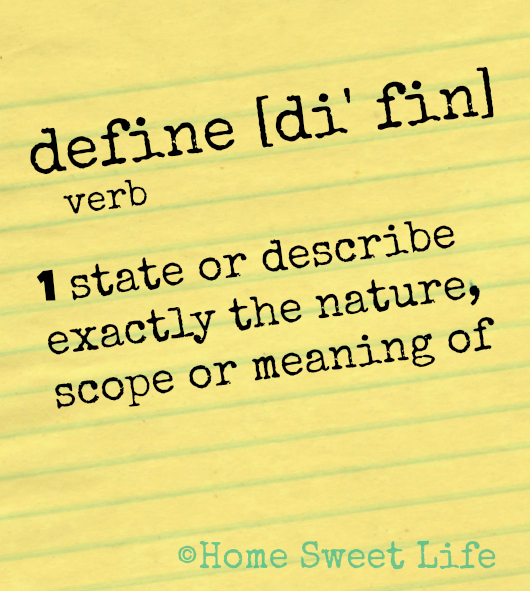 Wherever you are on this homeschooling journey, remember that it is just that ~ a journey. It is not just the destination that matters, it is the way you get there that will be remembered! Our oldest daughter graduated in December. Looking back, I realize that I am glad I cannot change the past, because the journey all of us took to get her to graduation is the one we shared together. The journey where we made memories, and she grew up loving her 'little' sister, is the journey that made her into the beautiful young woman she is today. Take heart Mama in the trenches! There is sunshine just for you, for your journey. 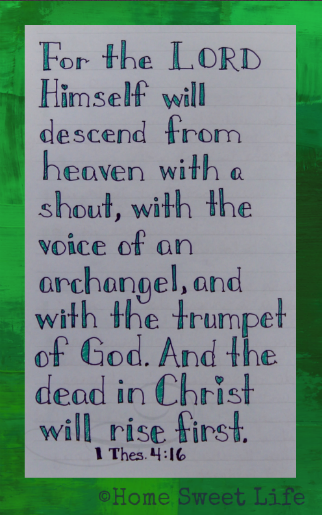 Just look up at the Son and you will find it! Does your family have an immigration story? When you were little did your Grandparents tell you stories about their Grandparents? While my family’s immigration story happened long before Ellis Island, Arlene and I were still intrigued to read Bessie’s Pillow, a story written by Linda Bress Silbert about her Grandmother’s Immigration to America in 1906 from Lithuania. Bessie’s Pillow tells the story of Boshka “Bessie” Markham and her life in New York state from the time of her immigration in 1906 through 1936. This unique story published by Strong Learning, Inc. tells not only Bessie’s family story, but also offers a detailed look into what life was like for a variety of immigrants, both rich and poor, during and after the days when Ellis Island was used as the stopping point for immigrants who traveled to the US from Europe. I really liked Bessie’s Pillow, it was an interesting story about a brave young girl who took the opportunity to travel to America to make a better life for herself. As she leaves her home she is given a pillow and the woman asks her to deliver it to her son who lives in New York. The story follows Bessie and the pillow from Europe to New York City where after a few adventures she ends up living with her friend Miriam and Miriam’s brother Lou. The story follows her though her life from her first job in America to another new job. It tells of her life until she finally delivers the pillow and what happens because of it. It shows her marriage and the birth of her first children and continues until her second round of children are all grown up. Bessie goes through many trials in her life from deaths in her family to having to learn to run a business to living through the first World War and the Great Depression. The story shows her love of her family and her perseverance to always see things through and succeed in a new world where she is both a Jewish immigrant and a woman. It also shows her kind and loving attitude to those who are beginning new lives for themselves and their families in America. As Bessie gets older and has a stable life she is always being kind and giving loans to those who need them. The story of Bessie's Pillow brought to mind many of the stories I had heard from both of my Grandmothers while I was growing up. It encouraged me to get out my own family tree and look at those names which had immigration dates listed beside them. One of the unique things I found with the book Bessie's Pillow is the companion website: Bessie's America which expands upon the information found in the back of the book. In the back of Bessie's Pillow there are about 20 pages of information explaining more about various topics covered in Bessie's story. There are also several pages of family pictures to peruse. The expanded coverage on the website gives links to finding out about European Immigration, food, movies, music, the Presidents, and much more. It also encourages you to search the Ellis Island database for your own family's connections. What I cherished most about reading the story of Boshka "Bessie" was the raw honesty of the conditions Bessie and others endured, both in their homelands in Europe, and in America. Reading about the Pogroms in Russian Lithuania and how hard Bessie's family worked to keep her and her siblings safe was both scary and reassuring. Knowing that there have always been parents who gave and sacrificed for their children gave me a nudge to do better at this myself. Since Bessie was Jewish, and chose to stick to Kosher foods, even as a First Class passenger on her ship crossing the Ocean she ate fish three times a day ~ because that was what was available. She also endured some unusual "advice" from the older ladies on her trip. Overall, this would make a great family read-aloud, however, because of the nature of some of that raw honesty, I would caution letting anyone under 14 read it by themselves. As a family book, you can skim over those areas, or provide an age appropriate summary. As readers, we live Bessie's life, the highs and lows, the triumph, and the heartaches. Bessie's Pillow is Historical Fiction book at its finest, because it is mostly historic, with just a touch of fictional detail fill-in to round it out. It was written based upon conversations between Linda Silbert's Mother and her Grandmother Bessie. What a wonderful testimony to the legacy of Linda's Grandmother. It makes me want to tell those stories I heard from my Grandmothers to our daughters, so they can one day be passed down again. This was a wonderful book to read, and I highly recommend you get your own copy ~ you will be glad you did! 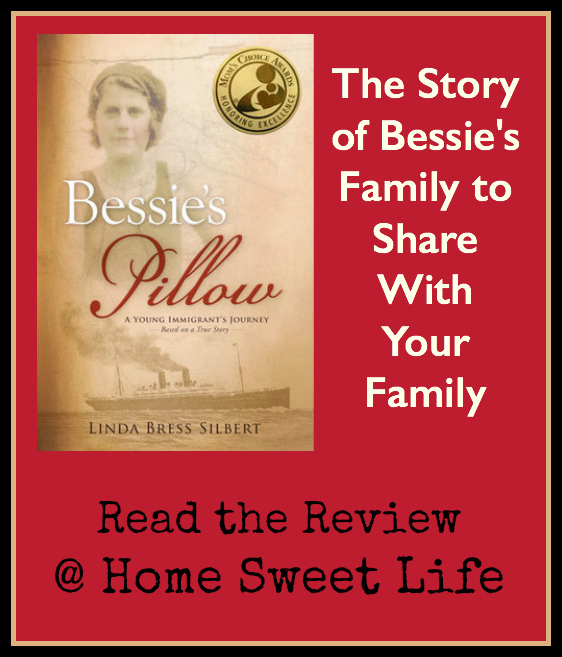 To read other Crew Reviews of Bessie's Pillow, just click the banner below! Were you wondering if I had forgotten? Nope, I remembered, but life said wait. This is a blessing I think too many Mamas miss out on. 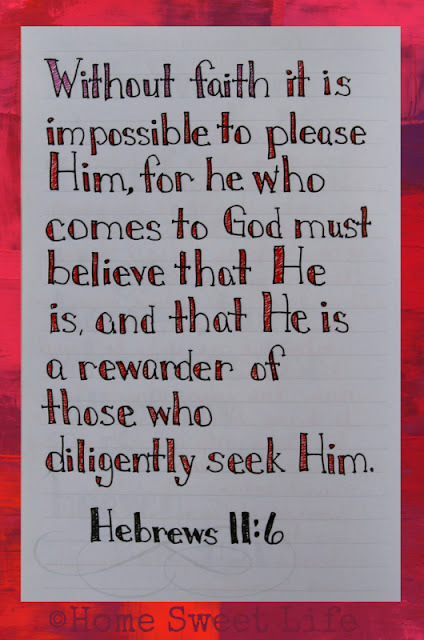 The blessing of having independent learners. Let me tell you a little story about the past four days. Hopefully by the end of the story you'll have a little peak into why I am blessed by the time we put in early on by teaching our girls how to be independent learners. Monday was the first day of work after Daylight Savings Time messed with my sleep. I got myself ready for work, checked to make sure Arlene knew what she was doing for school, and went to work. I arrived home to Arlene having done her coursework, she made dinner, and we headed out to a 3rd House legislative meeting with our State Representatives and Senator at our local library hosted by the League of Women Voters. Tuesday I got up early and headed in to work, while Arlene did her coursework and the laundry. That evening she had a welcome back and awards party for her volunteer position at our local history park. While she was enjoying the party with her friends, I went out to dinner with my friend Anne, whose children also volunteer there, and then we went to Goodwill. Two days down, no input from me except to make sure Arlene knew what needed done each day. No lectures to give, and no papers to grade yet this week. Sweet! Wednesday dawned bright, early, and cold! Arlene was helping her spinning mentor with Ag Days, a 4-H extension outreach to Second graders. She and her fellow spinner Abby worked with Sue to talk about and demonstrate spinning wool into yarn to several hundred schoolchildren. I spent the time getting my car serviced, and working on notes for my upcoming reviews. After I picked Arlene up we went to get fabric for her 4-H quilt. So now that it is Thursday evening, do I have a lot left to catch up on with Arlene for school? No. Because I invested the time when she was in Middle School to teach her how to learn, and because we lean towards the Charlotte Mason style of learning with living books and shorter lessons, plus a focus on narration, everything is completed for the week. What does that leave for tomorrow? Arlene and I are going to take Kurt's car for an oil change, then we're going to the gym to go swimming, followed by another stop to get quilt fabric, and an afternoon of writing reviews. Arlene will probably spend her afternoon reading a library book. Does this sound too simple for High School? Who decided it had to be difficult? This method fits us well, and it is realistic for both our High School Junior and this working Mama. Too often I find parents wondering if they can homeschool through High School. If you've laid a good foundation, High School is actually easier in many regards than the younger grades. I want to encourage you to take the time to teach your children to become independent learners, one skill at a time. I chose the picture above because it brings to memory something Arlene learned on her own: how to watercolor. I could have taught her what I know, but instead, I gave her access to two different good quality art books about watercolors. She simply read the instructions, followed the pictures, and practiced until she felt confident in her skill. I am so thankful for Independent Learners! Linking up with Amanda and Annette for Blogging Through the Alphabet, and Kym's Homeschool Highlights! Recently Arlene (16) and I have been reading the first two books from the Circle C Stepping Stones series by Susan K. Marlow. While these books from Kregel Publications are geared for ages 7-10, Arlene asked to be included on the review because she has enjoyed all the other books she has read by Mrs. Marlow. Last year Arlene even got to meet Mrs. Marlow at our State's Homeschool Convention! The books we received to review were: Andi Saddles Up and Andi Under the Big Top. Books 3 and 4 in the series are scheduled to release in November of this year. Arlene has loved all things horses since she was 9 and we sent her to horse camp for a week. Susan K. Marlow has written books about Andrea (Andi) Carter for all ages. This newest series, Circle C Stepping Stones, is designed to have longer chapters and deeper plots than the Circle C Beginnings series. After reading both books, I an certain that most 7-10 year old girls, especially those who love horses, will find them exciting. One of Arlene's first comments after reading through both books for the first time was: "You know Mrs. Marlow is a good writer when you get nervous or excited right alongside Andi!" Andi Saddles Up tells the tale of Andi beginning to ride her horse Taffy with a saddle and full tack, while her older brothers deal with a land border dispute with their neighbors. Since Andi has just turned 9, she is given the freedom to ride further from her family's house on her own, as long as she stays on their ranch. There are some lessons about truth-telling and obedience that Andi learns the hard way during the story. She makes friends with her neighbor Sadie, and the girls' friendship helps the two arguing families come to a peaceable resolution. Andi Under the Big Top brings to life the excitement, drama, sights and sounds of the traveling circus in California during the late 1870's. Along the way Andi learns just how much she is loved, and begins to have a true understanding of why and how we are called to help those less fortunate than ourselves. Andi and her friend Cory meet and befriend Henry, a little boy who ran away with the circus. There are harrowing feats occurring under the big top, as well as behind the scenes. Once again, Andi learns some valuable lessons, and is reminded of how fortunate she is to have her Mother and older brothers and sister looking out for her. 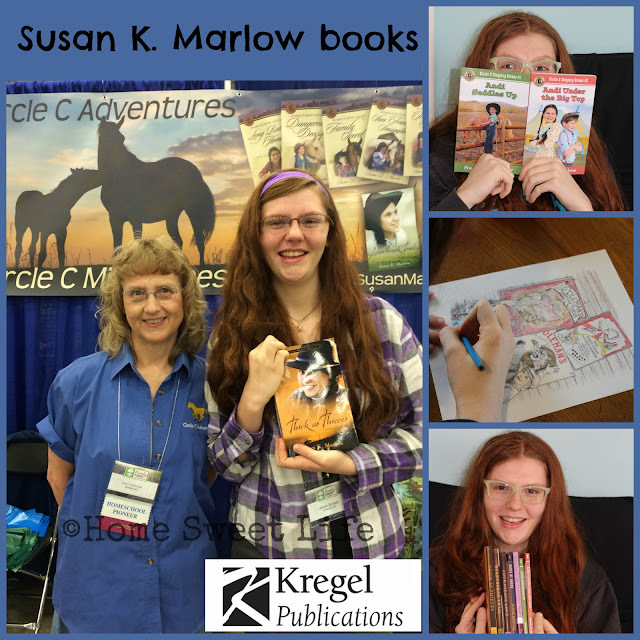 Susan K. Marlow writes supplementary material to go along with her books about Andi's adventures. There are free coloring pages and activity pages for each of these two books. There is also a two-lapbook packet available for purchase. Arlene and I went through the coloring pages and chose some to print off for her to color. The pictures are from the illustrations from the books. There are six from each book. The activity pages cover all sorts of topics related to Andi's story, horses, and life in California in the 1870's. There are word searches, comprehension questions, vocabulary words, Bible verses relating to character traits, fun activities and more. The activity pages from Andi Saddles Up come with a schedule to have your child read the book and do the activities over 28 days. While most children will be ready to read the whole book sooner than that, it gives parents a way to dig deeper into the lessons and history presented in the story. A short English curriculum, fun activities, and a design your own saddle page - perfect for horse girls! 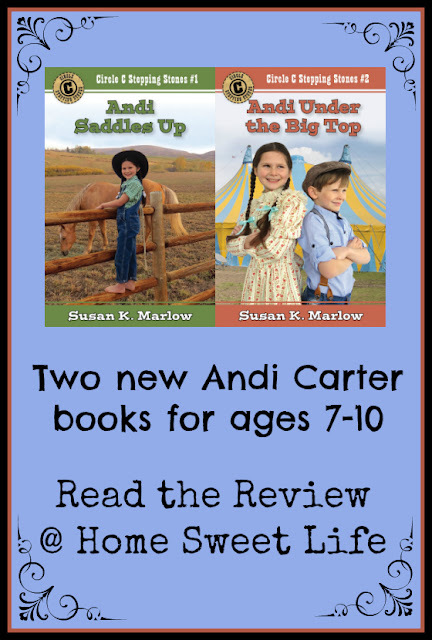 If you have younger or older girls, or boys, Mrs. Marlow has additional series about Andi Carter and the Old West. Circle C Beginnings is a set of first chapter books for ages 6-9. Circle C Adventures is Andi's story during the 1880's and is geared for ages 9-13. Circle C Milestones is Arlene's favorite series, as it follows Andi from ages 14-18 and is geared for ages 11 and up. If you have boys, or adventurous girls, Susan's Goldtown Adventures series was written for boys ages 8-12, but Arlene and her sister enjoyed them as well. I'd like to take a moment and just mention what a delight it was for both Arlene and I when she met Mrs. Marlow last year. Susan is a gentle lady who loves to share her love of horses, the Old West, and learning with all of her readers. I was impressed by how there are enrichment activities available for her various series, and how she has woven the story of Andrea Carter to cover not only so much of her life but also various reading levels. Arlene is looking forward to seeing Mrs. Marlow again next week at our convention. Fans of Andi Carter can keep tabs on new books, contests, and more info from the ranch by reading Andi's Blog at www.circlecadventures.blogspot.com. I liked both of the new Andi Carter books that we reviewed. Andi Saddles Up was about Andi and some problems that the Circle C ranch is having with one of the neighboring ranches when the creek which acts as the dividing line for their properties changes during a heavy rain. Andi doesn't see what the problem is until the dispute starts to get in the way of her new friendship. I liked the first book but I liked Andi Under the Big Top even better as the old time circus has always fascinated me. It was so fun to read about the costumes, the clowns, the sideshows, and most interestingly, the people who worked there. In this book Andi thinks that joining the circus sounds like a lot of fun, always performing and doing tricks. But she soon learns that it's not all fun and games when she meets a boy who she learns ran away from home to join the circus. He shows her that it's not all fun and games but lots of work and little to no pay or appreciation. I loved these books as much as all of the other Andi Carter books that I have read! They, just like the others, all have fun and adventure while always reminding the readers of important lessons. Like when you parents or older brothers tell you not to do something it's for a good reason not just because they are being mean. Or that running away from home to do something exciting may sound like a good idea at first, but life on the road is not always easy and fun. At the end of both books is a section telling the readers a little bit about the real life events that the stories were based on. Telling them about ranch life and old time circus life. To read our previous reviews of Mrs. Marlow's books, click on the titles below! To read all the Crew reviews of Circle C Stepping Stones books 1 & 2, click the banner below! 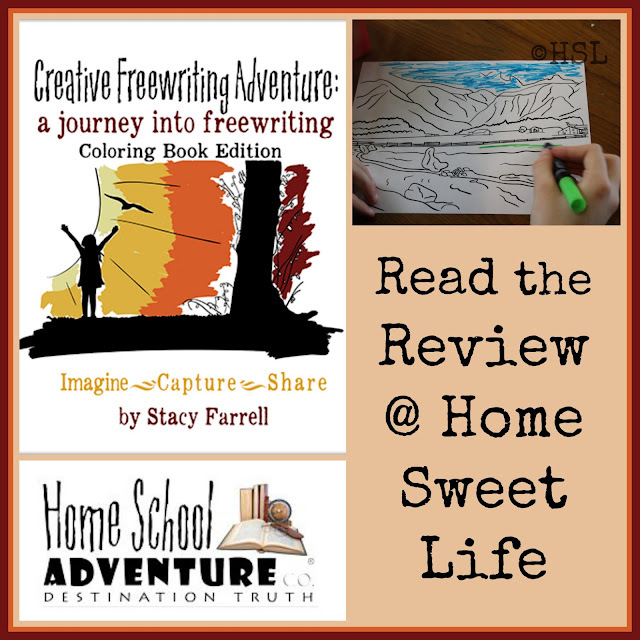 Arlene has been doing some 15 minute Creative Writing exercises recently thanks to Creative Freewriting Adventure from author Stacy Farrell over at Home School Adventure Co. We were also able to see and review the newest version of this resource, Creative Freewriting Adventure Coloring Book Edition. We have used and enjoyed other resources written by Mrs. Farrell, and Arlene was enticed by the promise of only needing to write for 15 minutes a day, so we jumped right in. Since the only major difference we could see was that one had coloring pages, and the other did not, we just worked from the Coloring Book Edition. Creative Freewriting Adventure is different from other writing prompt curricula because it does not just give a line or idea to start a story from, it gets the student immersed in a story, and then gives them jumping off directions. Many High School students have lost their joy for the writing process because they have spent so much time on multiple re-writes of the same assignment. These exercises (10 in all) give them a chance to set a timer for 15 minutes and write without pressure to spell or punctuate correctly. It helps them be creative again, and it allows them to write the ending of the story however they want. Sometimes Arlene found that the timer went off before she was at the place she wanted the story to end. Because she was enjoying writing, she lost track of the time and just enjoyed flushing out the details of the story. On one of the exercises, she asked for "five more minutes?" at the timer and ended up writing for almost two hours. I'm not saying your reluctant writer is going to change overnight, but I really do think these exercises free the student up to think big and broadly about where they want the story to go, without the pressure of proofreading. Still wondering how these creative writing exercises work? Stacy Farrell has written each lesson/ prompt with three parts, the third part being three sets of jumping off questions. Each lesson begins with some background, either about the person involved, or the story's original writer. This section included some sort of artwork, usually a painting or two, one of which the coloring sheet is based upon. Then comes the actual start of the story. There is just enough in each one to get you hooked into the story, and then come the jumping off directions. This third part of the exercise has three parts: background, dialogue, and incorporate your senses. The background part asks students if they want to include anything else in the story's start to hint towards where it will go, the dialogue section questions make the student think about who will speak and what they will say, and the incorporate your senses questions ask them to think and write about: What do you see, what do you hear, and what do you smell, etc. I really liked these detailed jumping off questions as they give the student some parameters to think about, while still giving them the freedom to take the story where they want it to go. Because there are so many questions to choose from to help them think you could easily have the student come back and start from the same story a few months later and they would come up with a totally different ending. If they focused on the dialogue one time, they might focus on the senses used to describe the scene the next time. 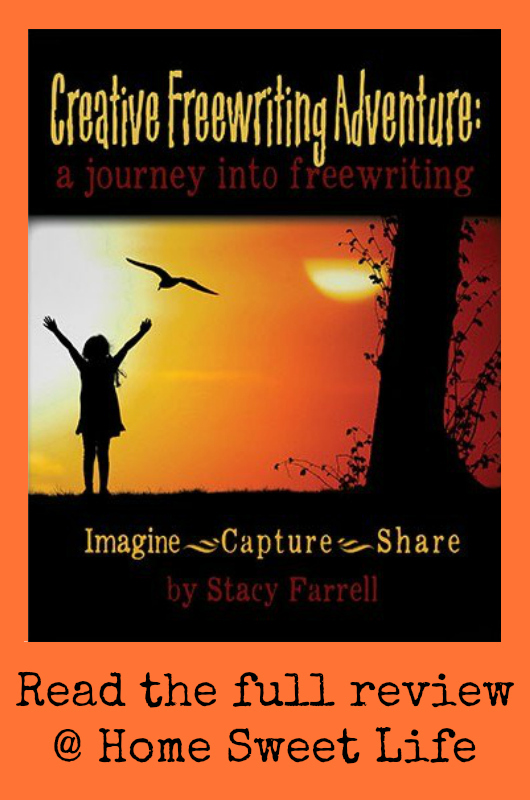 I really liked Creative Freewriting Adventure. The story prompts were interesting and all so different from each other that I had lots of fun with the different plots that I could make for each. I liked the ancient stories and the various prompts from the story of the wise woman, but my favorite was the story of the purple cave world. I liked it so much that I went way past 15 minutes and had to go back and figure out how far I had gotten so Mom could see that part for her review. Anyway the 15 minute part was fun but I have changed my cave story and started to make it a lot longer the I could have in the 15 min. timer. I like the story of Thales and of the Pegasus, and I didn’t like the princess. For most of the stories I was close to done in 15 min. so I finished then, but for the cave story I went on for like 2 hours. They are all lots of fun and its really interesting to see how far you get in 15 min. I walked into the picture of the farm with the small river. it is even more beautiful the it looked as a painting. my feet were bare and the grass was soft agents them, the brook looked inviting and the girl in it seeing me waved her hand towards me. Walked across the soft grass the the bank of the river a stood near the girl. “But I can not live on a farm.” I said. I looked at her. “I will not! I told you I am a princess and can not and will not do hard labor.” I walked away from the stream. Why had I ever thought this was a nice place to come to. I wanted to go home where I had all the servants I wanted to bring me food and take care of all my needs. I walked until I got back to where I had first come into the picture sone distance away from the girl and her stream. I knew that I had come here form the horrid old woman house I was in a painting surely there was some way to reverse the magic and get me back out. Would like to view a sample of Creative Freewriting Adventure Coloring Book Edition? It is available on the Home School Adventure Co. website, just scroll down below the product description. While geared for High Schoolers, this would be an appropriate resource to use for Middle School students who have already had some solid writing instruction for fiction, and who would like a break from editing and re-writes. We received both of these as PDF downloads, however the original Creative Freewriting Adventure is available in both print or downloadable format. 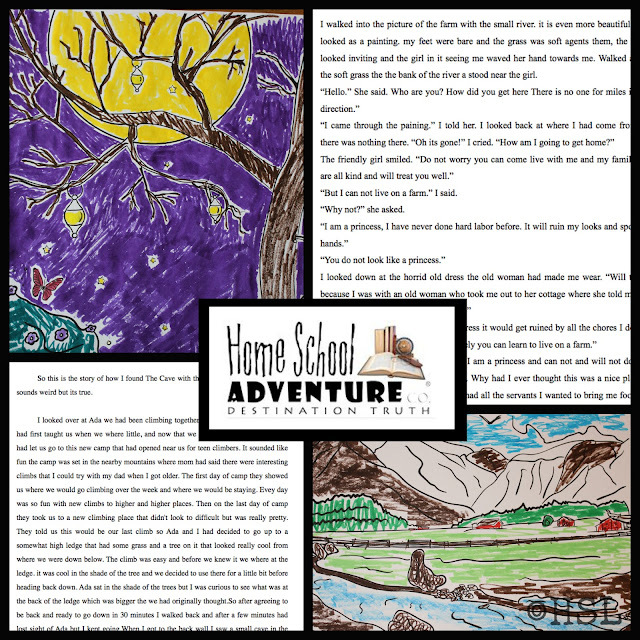 The Homeschool Review Crew was offered a wide variety of resources from Home School Adventure Co.
Click on the banner below to read all the reviews. 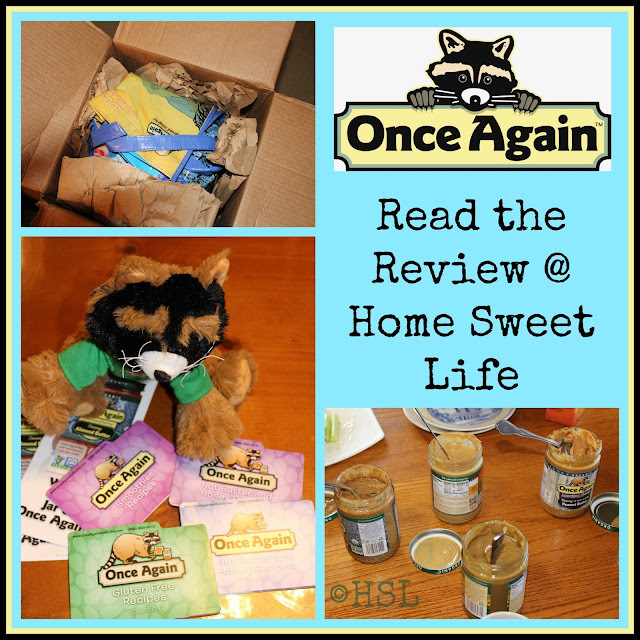 Shortly after joining the Blog Ambassador program at Moms Meet I received my first review assignment: Once Again Nut Butters. 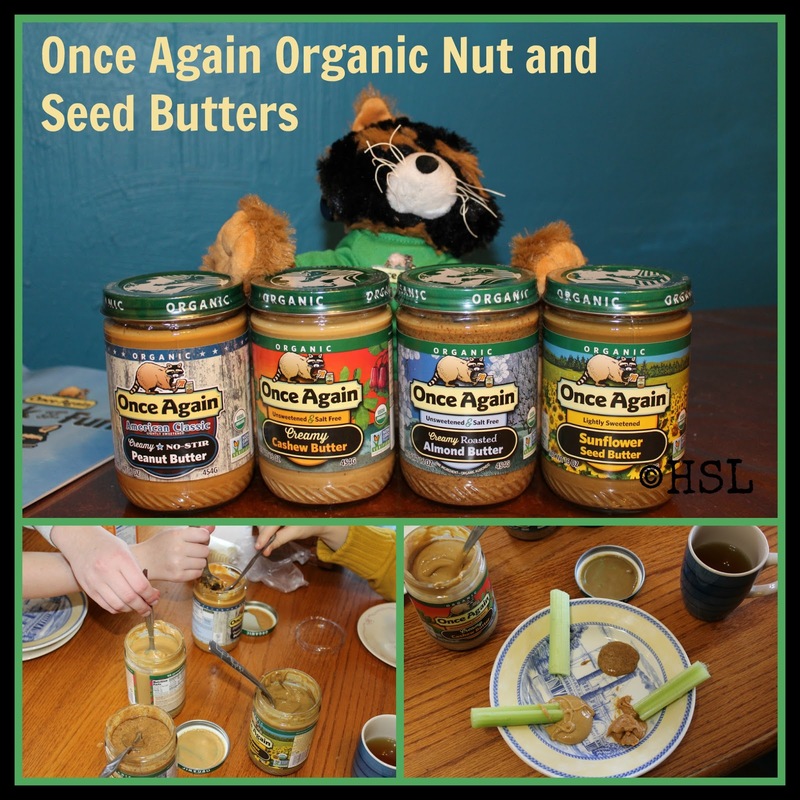 Arlene and I realized that to do justice to four different types of nut and seed butters during the limited time of this review, we should enlist some additional help. Even though I like nut butter on my celery, it was going to take us a while to really use four full sized jars! Since the rest of our family is often gone to work all day, we planned a lunch date with my friend Danielle and her girls. Arlene (16) decided to give the coloring book to her friend Rachel, who is several years younger. Also attending our tasting party was Danielle's daughter Emily who is nearer Arlene's age. We started with lunch, hoping to make the tasting party a slow-food event, instead of rushing it because everyone was really hungry. We put out the three nut butters and the Sunflower seed butter, as well as celery and two different types of crackers, then we let everyone taste to their little hearts' content. Danielle and I talked about how we might use the butters in smoothies or cookie recipes, and I gave her one of the booklets with smoothie recipes. The girls tasted each of the various kinds on crackers, and then went off to talk in the other room. After a few minutes they were back again getting more nut butter and crackers. Arlene's favorite was the Creamy Peanut Butter, Emily said she really liked both the Peanut Butter and the Cashew Butter, and Rachel was torn between the Sunflower Seed Butter and Peanut Butter as her favorite. We talked about the taste, the consistency, and the spreadability of each of the butters. Danielle and I both thought the Cashew Butter was good, but could be improved by the addition of a small amount of salt. That is probably because I, at least, usually have lightly salted cashews to snack on instead of unsalted ones. Overall Danielle's favorites were the Peanut Butter and the Almond Butter, while my favorite was the Sunflower Seed Butter, with the Peanut Butter being a close second. Arlene and I continue to eat the butters at home, and sometime I pack a couple Tablespoons of the sunflower seed butter in my lunch to eat with my celery or crackers at work. Arlene loved how well the creamy peanut butter tasted on saltines, which is ironic, but encouraging, from a girl I have trouble getting to eat peanut butter in anything except cookies! We are planning to try the almond butter in our cookies soon. I would also like to try the sunflower seed butter and cashew butter in smoothies. Thanks to the recipe booklets I now have lots of new ideas for my smoothies! Once Again Nut Butters offers a variety of Natural and Organic Nut and Seed Butters, as well as honey, and bulk roasted nuts. We were excited to be able to review these Organic butters, especially after researching the company and finding out how well their mission lines up with our food philosophy. Once Again Nut butters supports Organic and sustainable farming practices as a part of their mission, and is an employee-owned workplace. For those Moms (& Dads) looking for a company to trust with the health of their children, this one measures up well! Overall, the quality of all four of the nut and seed butters was excellent! The jar labels all come with a space to mark the date you opened them, and they recommend refrigeration on all but the peanut butter to keep them fresh and to prevent the oil from the nuts and seeds from separating out. The American Classic Peanut Butter does not separate (unless it gets over 90 degrees in your kitchen) thanks to the addition of a small amount of organic palm fruit oil. It is really SO yummy! All four varieties we received are Gluten Free Certified, Vegan and Kosher.